'Pink Froth' (Keith Keppel, R. 1985). Seedling# 76-122B. TB, 34" (86 cm). Early bloom. 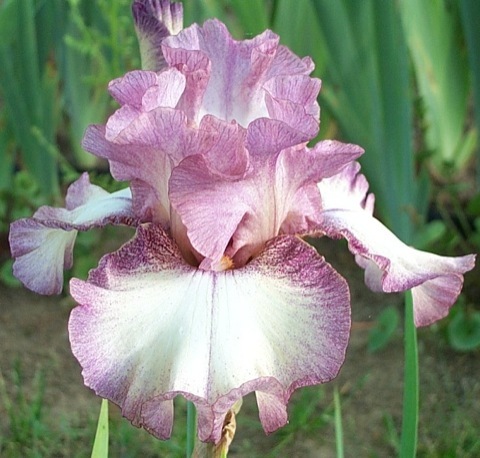 Standards lavender pink (M&P 43-D-1) suffusion on creamy white ground; Falls white, 1/2" solid lavender pink edge, deeper (43-1-4) hafts; rhodonite pink (43-G-1) styles; white beard tipped tangerine pink; ruffled and lightly laced. Seedling# 72-30E: (seedling# 68-39D: ((('Irma Melrose' x 'Tea Apron') x (('Full Circle' x 'Rococo') x 'Tea Apron')) x 'April Melody') x 'Apricot Blaze') X seedling# 74-37C: ((seedling# 68-39D x (seedling# 66-35C x 'April Melody')) x 'Osage Buff'). Keppel 1985.